The fortified wine of Madeira is a well-documented subject but none the less interesting (or delicious) for that. But as for all wines, the experience is not complete without visiting the source, and I am writing this on the north coast of the island, on the quayside at the village of Seixal. 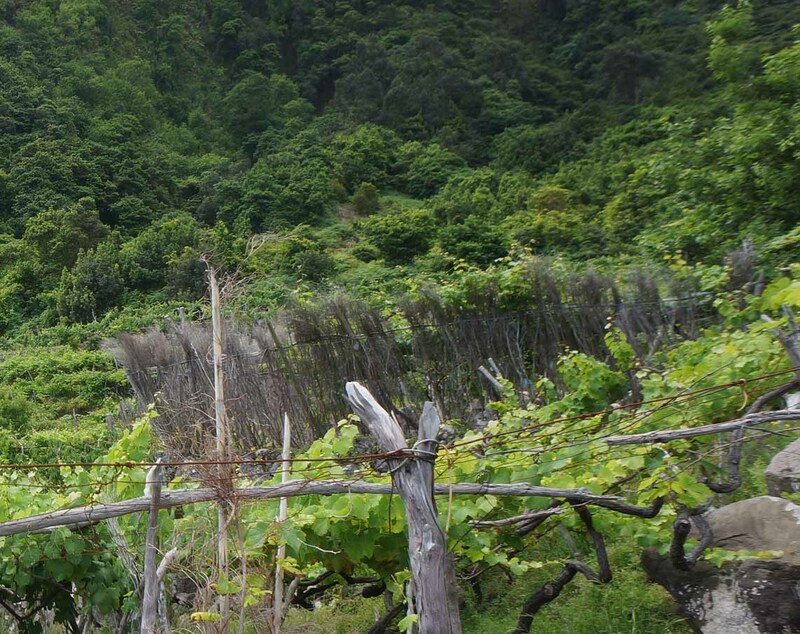 Vines stretch up the hillside behind the few buildings, twenty or so terraces, each about ten metres square, stacked upon each other on a 45 degree slope, until the hillside tilts almost to a cliff, too steep even for vineyards. Access is by flights of stone steps along the edge of the plots. All the vines I have seen here have been trained into pergolas, the leaf canopies about five feet (1.5 metres) above the ground, and well-maintained, so that it is possible, and fun, to duck under the outer edge and walk at a crouch through the cool, dimly shaded plot between the gnarled and twisted trunks, to emerge into the fierce sun at the other end. But from nearby it is not always obvious that there is a pergola, for the outermost vines are sometimes left unpruned, and grow to resemble an irregular, dense palisade of dead wood that hides the hollow interior. The vineyards of Seixal are mostly Boal. The berries right now are still small and unripe. In the mouth, the only possible description is crunchy, with tough, thick skins and bitter juice. Piercing acidity is a hallmark of Madeira wine, and offsets both the various levels of residual sugar (there is always some, even in Sercial) and the tertiary nut, dried fruit and coffee character acquired through the initial maturation in part‑full oak barrels in the warm roof‑spaces of the lodges and warehouses. If you are not familiar with madeira’s unique ability to improve indefinitely with age, it is due to this intentional oxidation of the new wine, a benefit discovered accidentally centuries ago: barrels of wine sent to the Indies were sometimes returned unsold, and were found to have benefitted from the two transits around the equator. Earlier in the week I also saw this maturation process first-hand. 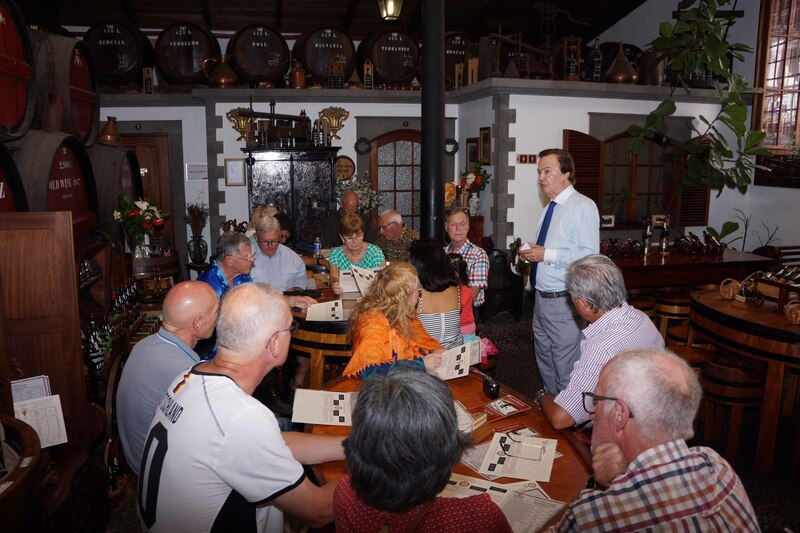 I am in Madeira with a walking group, many of whom expressed interest in visiting one of the lodges. 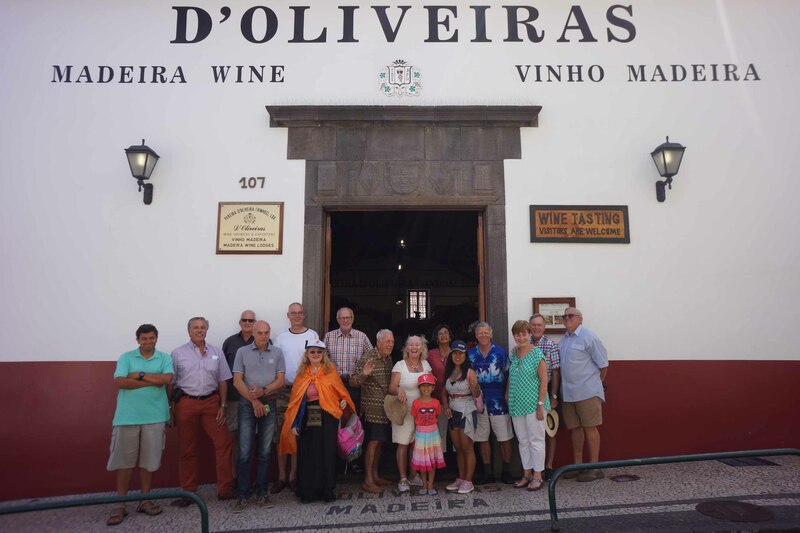 Through the UK agent Geoff Cole of Bovey Wines, an appointment was made to meet Luís d’Oliveira, the fifth generation to run the family business started by Pereira d’Oliveira in 1850. Three tables were waiting for us in the 400 year-old former school-house. The format was to be four pairs of wines of increasing sweetness, the first of each pair being 90% Tinta Negra with the remainder of the blend being Sercial, Verdelho, Boal and Malvasia Cândida respectively. The second of the pair was of higher quality, being solely made from these four, original, grapes. Cheese, crackers and crisps appeared, and with the first two glasses (the dry blend and a 1990 Sercial) Luís explained the history and creation of his wines. We moved on to a semi-dry and 1994 Verdelho, a medium-sweet and 1992 Boal, and finally a sweet and 1996 Malmsey, these accompanied by the traditional rich Madeira cake (this recipe made uniquely for d’Oliveira by a long-standing supplier). Behind the counter at d’Oliveira are bottles and barrels in profusion, but this is only one of six stores, for d’Oliveira have easily the greatest library of aged madeira, a total of 49 vintages stretching all the way back to 1850 and all available for purchase. I took a just about accessibly priced 1978 Boal… and a cake to go with it. As the wine will outlast the cake I will attempt to cook more of the latter as required. 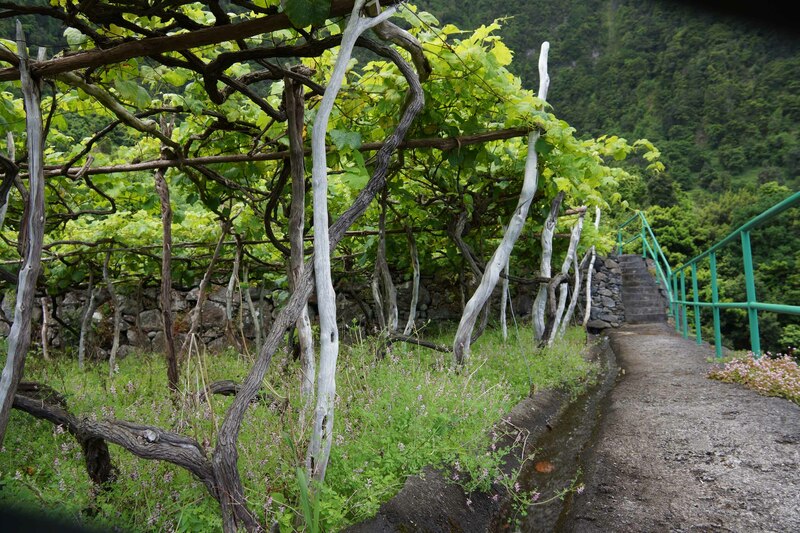 Like sherry and port, madeira is a legacy product from the days when fortification with grape spirit was virtually obligatory in hot climates to prevent the wine from spoiling. That need has now passed, and the modern winemaking practices that have made it unnecessary have also facilitated production of a vast international plethora of table wines that have pushed fortified wines to the edge of the market, and the edge of meals, as apéritifs and digestifs. Vineyard areas are much reduced from their heyday, but quality has never been higher, nor the pleasure of drinking them. But as with all wines, this pleasure is enhanced by knowing the story of their origin and by personal associations. Madeira’s story is as interesting and unique as the turbulent hills and valleys of the island on which it is made, and my visit provided the associations. I am looking forward to tasting my Boal, and comparing it to a 1976 already part-consumed. Don’t ignore this marvellous wine! Saúde! With thanks to Geoff Cole and to Luís d’Oliveira and his staff.